Comets get people excited, and even a faint one provides a new target for us to search for. 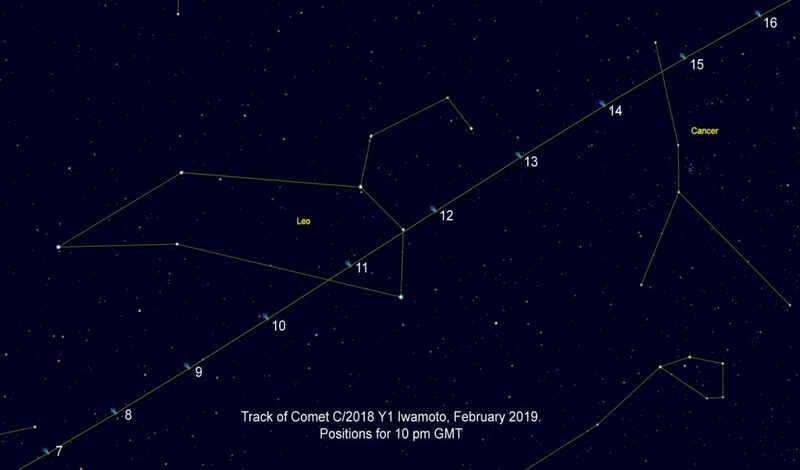 Comet Iwamoto promises to be just such a comet, a fleeting visitor to our skies that will prove a challenge to many people, but with the great advantage that it’s accessible at a good time in the evening and high up in the sky, in Leo. The comet is currently around 7th magnitude, which puts it on a par with all but the brightest deep-sky objects, and larger than most so it is visible with binoculars, though not from urban light-polluted areas. See the Visual Observations section below for updated reports. Here’s the track of the comet as it passes through the constellations of Leo and Cancer during the second and third weeks of February 2019. The comet symbol has a tail but currently the comet itself doesn’t display any appreciable tail and is just a fuzzy blur of light. 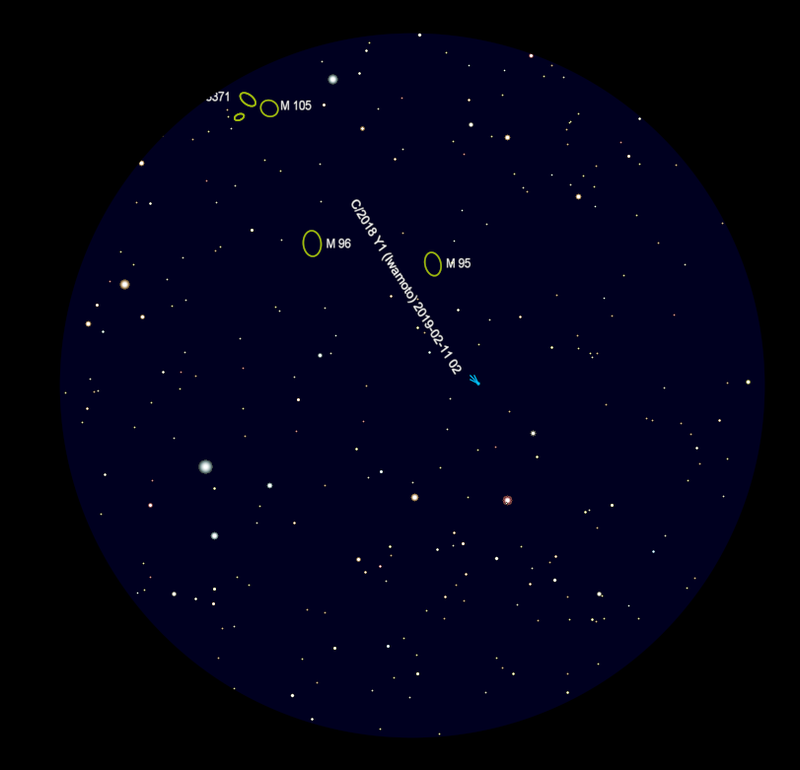 Leo is in mid sky looking south-east by about 10 pm in mid February, and is due south about 1 am. The shape of the lion which Leo depicts is one of the most striking constellations. The comet was discovered only last December by a Japanese astronomer, and until now it has been visible only in the southern hemisphere. But it’s making its way northwards, and it reached perihelion (closest to the Sun) on 7 February, with closest approach to Earth on 12–13 February. Recent observations give quite a range of brightnesses, between about 5.5 and 7. 4, which is typical for this type of object. Its total light is spread out over a considerable area of sky, and only the central area is visible in poor skies but those with dark skies can see a greater extent. 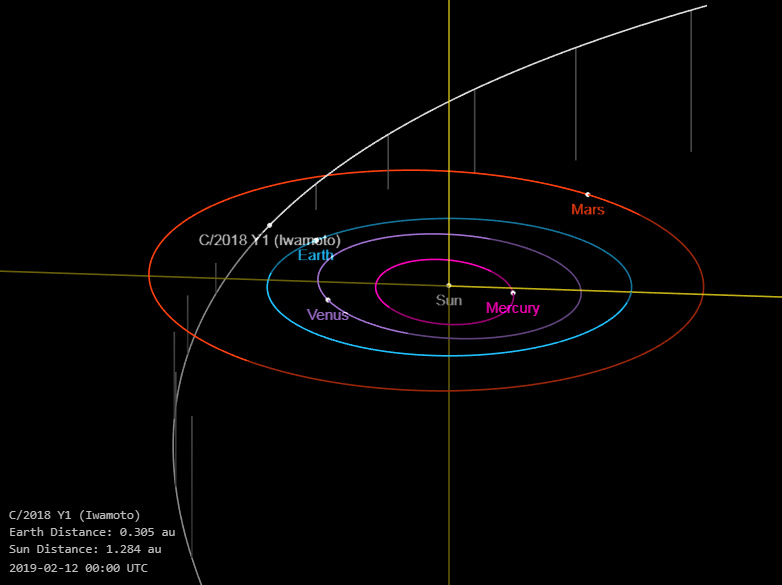 The orbit diagram below shows that at closest approach the comet is comparatively close to Earth, at 0.305 astronomical units, or 45 million km. It’s a periodic comet, returning to the Sun about every 148 years, but was not noticed on its previous visit in about 1871. Here’s the track of the comet as it passes the galaxy pair at 2h GMT on 11 February. The outer circle is 5º across, which is a typical field of view of a finder telescope or 10 × 50 binoculars. To photograph the event a DSLR camera at the prime focus of a small refractor or reflector may capture both the galaxies and the comet in the same field of view, but the rapid motion of the comet through the sky will limit exposure times to a minute or so before the comet starts to trail. You’ll need an accurately driven telescope, and guiding will probably be needed as well. The rapid movement of the comet makes photography difficult, because with most telescopes the comet moves noticeably against the starry background in less than a minute. So images taken with telephoto lenses, with shorter focal lengths, are more successful unless you can do a lot of clever image processing! Saw it at around midnight on February 10-11 when clouds obligingly opened a chasm of excellent mag 6+ sky for about an hour. Found it in less than a minute; it was an easy catch in my 14-inch Dobsonian’s 9 × 50 finder and conveniently located next to two stars, perfect focusing aids! At 66×, a quite large coma was visible with a bright little spot at its centre, the coma fanning out to one side to an extent of about 12 minutes of arc. No tail was visible. Adding an UHC filter improved the view, as did a jump to a magnification of 110×. Was there some condensation around the pseudo-nucleus? Removing the filter and moving up to 200× showed that there definitely was, to the north of the pseudo-nucleus an appreciable area showed denser spots, a fact confirmed at 330× and 400×. Sunday-Monday, 2345-0020 UT (midnight). 10th-11th February: Located 53 Leonis, up from Rho Leonis and its adjacent asterism. Star 53 Leonis makes a triangle with two fainter stars and to the right were three faintish (8th magnitude ?) stars and the fuzz-ball of Comet Iwamoto making a figure like a diminutive “bowl of the big dipper” or “body of the great bear”. The comet seen possibly somewhat larger and more obvious than previously but still with the vaguest of edge. The sky was of good transparency although bits of cloud drifted by and was finally clouded out. Used the Nikon 15-45 × 60 spotter from the back garden which was pretty dark, everyone having gone to bed. Then thought that I would try with the Bresser 10 × 50, handheld but rested, and was able to see the fuzzy patch of the comet in that. Then tried my 8 × 40 binoculars, and could just about see it in that too! My site on the London side of High Wycombe is not great for faint objects, though we are right on the edge of the Chilterns AONB. While the camera was taking some driven shots I took a look with 10 × 50 and 16 × 50 bins just after midnight on the 12th. Iwamoto was only faintly visible using averted vision with the 10 × 50s, and I probably wouldn’t have spotted it if I hadn’t known it was there. But with the 16 × 50s it was fairly obvious, though by no means bright.